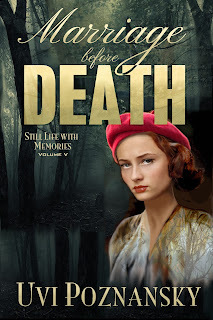 Fifth in the Still Life with Memories series, Marriage before Death takes readers to the dangerous small towns of France just after D-Day. The German occupation is failing, and those in the resistance find their lives increasingly in peril. But what of resisters who aren’t even French, who might be labeled spies and be betrayed for the price of a life or a hat? And what of those who meet in surprise, neither knowing the other would be there? Knowing the future adds an interesting poignancy to stories from the past. Readers know from the start that Natasha’s memories are fading. But Lenny’s memories are clouded only by love and uncertainty. As the characters play their different roles, the question of who is real, what memories are true, and what constitutes personality lie in the background, enriching every step of the path. The writing is musical, as befits a tale with a musical protagonist. The story is intriguing with some sweetly touching scenes. While the reader will guess before the characters what’s going to happen, there’s always that interesting question of memory and reality. A cool addition to the series, and an enjoyable glimpse of different times and lives, I enjoyed Marriage before Death and I’m eager for more. Disclosure: I already love the series and I got this one on a deal.